We invite you to experience the positive impact beauty & creativity have on the soul, by joining us for one of our monthly workshops. Express your own creativity, socialize over tasty refreshments, and leave with your own masterpiece! We will set you up for success by providing everything you need, including an expertly curated mix of the best flowers each season has to offer, vases, and tools. Though we will be on hand to assist, our monthly, themed workshops will have limited instruction, as this is a time for you to be the artist! Check back soon for other upcoming workshops! Can I pay for the workshop the day-of? We cannot receive payment the day of the class, unless there was a cancellation and you are next on the waiting list. Fresh product and supplies must be purchased well ahead of time, so your registration fees must be received no later than 72 hours ahead of the workshop. Can I bring my children to the workshop? We love children, but our working floral studio is not a safe place to play! Unless you are attending a class that is specifically advertised as tailored for parent-child participation, please secure childcare and come have fun with your grown-up pals, age 16+. Can I bring my own vase? We will order the corresponding amount of flowers needed to fit the vases & containers we provide for each workshop. For this reason, we cannot accommodate custom vases unless specified in class description. If I bring friends, can I get a discount? Discounts on workshop registration are only available for large private parties, and will be determined based on specifics to that event. In addition to street parking around the complex, there are a handful of parking stalls in the lots across the street, which are marked “visitor”. Please do not park in numbered stalls that are dedicated to other businesses. We take great care in preparing for your arrival with the purchase of flowers, supplies, and baked goodies, as well as reserving space for you to work in our busy floral studio, but we understand sometimes life surprises us. You may cancel your registration for a class up to 3 days in advance of the workshop. No refunds will be honored for cancellations submitted less than 72 hours prior to the workshop. 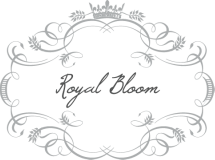 Royal Bloom reserves the right to cancel any event that fails to attract sufficient enrollment, or due to other unforeseen circumstances that make it impossible to proceed as planned. In case of cancellation of workshop, we will contact you by email or telephone to issue a refund, or you may request to be transferred to another workshop of your choice, according to availability.